Never been quite sure whether you want to leave shore on a cruise? As part of our ongoing ‘Everything you need to know about cruising’ series we’ve got 27 things a first time cruiser should know. Everyone knows a cruise person, right? The only holiday they’ll ever go on, bagging a new voyage each year, more than happy to share hours of open-ocean tales and endless snaps, even when you’re doing your best to not show interest. For all of you on the other side, the cruise virgins, have you ever been a shade curious about what the attraction is? You are, because you’ve read this far. So let’s smash a few of those cruise clichés and answer what the non-cruisers have always wanted to know about cruising. What’s it really like to cruise and how do I do it? The fundamental rule: find a cruise expert/travel agent to take a full audit of what you like and, as importantly, what you don’t. Only then can they recommend the best fit for you from the oceans of choice out there. Last-minute deals may save some dinero, but you’ll probably end up on the type of cruise you don’t want. Book as far ahead as possible, between nine and 12 months is bang on. There are exponential possibilities for cruising, determined by three factors; ship size (small/big/large); travel group (couples, singles, young, old); and style – ranging from adventurous expeditions through Alaska and the Kimberley to lazy luxurious river cruising in Russia and Portugal. Many non-cruisers assume a cruise ship is just a floating RSL. Some are, most aren’t, but know that you definitely get what you pay for. In the spoil-yourself category sit brands such as Seabourn, Silversea, Viking, Azamara, Regent Seven Seas, Hapag-Lloyd, SeaDream and Crystal. It’s not a ‘schoolies’ event on the open ocean. Not only is the average age of cruisers getting younger, but cruise lines are now targeting the younger markets. U by Uniworld, for example, is a river cruise line just for millennials. Royal Caribbean, Carnival and Celebrity are tweaking some of their ships to appeal to millennials too. 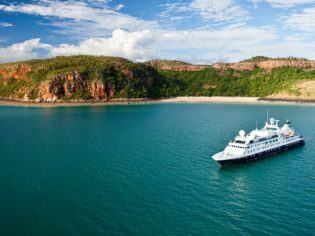 From an Australian port, you will spend more days at sea, naturally, so it’s vital that you should love your ship (and its bells and whistles). In Europe, you’ll wake up in a different port every morning so it’s the itinerary that’s king. …in the middle of the ship (because they cop less sway). Always, always opt for a balcony if your budget stretches. Check it closely to make sure it covers all elements of cruising. Cruise ship doctors and medical services can be expensive in an American-health-system kind of way. Obviously, seasickness can and does happen, but less so than you think. The larger ocean-going boats are fitted with stabilisers (a good question to ask) that counter much of the swaying. If you’re prone to seasickness, make sure you buy the remedies on shore, as they can be expensive on board (pressure point wrist bands work the best). If you’re not on a digital detox, and plan to use your devices throughout the cruise, invest in a Wi-Fi plan. Piecemeal can end up super-duper expensive. And don’t expect it to be super efficient when you’re at sea. 11. Book your optional extras ASAP! Don’t dilly dally, book the restaurants you want to eat at as soon as you’re on board (or before if possible) because they will book out, especially on the big nights (first/last). Same goes for spa treatments, excursions and kids’ clubs. If you’re on a cruise for a couple of days, then eating at the buffet is fine. Any longer, and you will want to splash out on a restaurant (or five). These days, cruise lines offer fine dining experiences from the world’s top chefs, from Jamie Oliver to Nobuyuki ‘Nobu’ Matsuhisa. If you are only having a glass of wine over lunch and maybe a few glasses more for dinner, then no, it’s probably not worth taking the drinks upgrade. If you’ll be upping that to the odd bottle, then it’s time to investigate the upgrade. Celeb chef Jamie Oliver has opened his Jamie’s Italian restaurant on board the Quantum class of ship (Ovation of the Seas in Australia). Resist the urge for a biblical night on the plonk on night one. Having a hangover to contend with the next day while you’re still trying to find your sea legs is a fine balancing act for the stomach indeed. Don’t panic about booking up every single shore excursion; some are super-fast so you might not get a real appreciation of where you are and some can be pricey. They do come in handy when the port is far from the attractions of the area and there’s nothing else to do there. Don’t be afraid to take the day off. Just follow whatever tickles your fancy – unless you’re in St Petersburg, where things can be complicated and it’s better to do that pre-booked tour through the ship. Most cruise lines spend 12 to 14 hours in a port, but there are options to extend. So dare to explore yourself (one of the best days of our Med cruise was when we cancelled the day trip to Florence and caught the train to Pisa). Unforeseen tropical cyclones aside, you’ll be rocked to sleep like a baby every night. Cruising really is the best holiday type in the world to completely let your tired mind repair its frazzled cells. The casino is often where night owls flock, where fellow insomniacs can bond over Black Jack. Watch the cocktails though while you’re at it or it could be an expensive night. Don’t use the gym treadmill in rough seas… especially after a late night in the casino. Attend a lecture or two: it’s a good way to balance your day and you may learn something from not only local food and wine experts, but also world-class speakers who often find their way on board, such as Margaret Atwood and Apollo astronauts. In our experience this lovely teak decked expanse is for some reason rarely visited by other passengers. You’ll get the occasional Kate Winslet impersonator but other than that it can be a quiet place for contemplation, gazing out to sea. A cruise ship is a well-oiled machine, and seasoned cruisers know the drill. Make sure you don’t miss out on vital information, like we did when we neglected to leave our luggage outside our door the night before we disembarked the QM2 (Queen Mary 2) meaning we had to wheel our suitcases to breakfast and then take them off the ship ourselves (it’s a hard life!). So relaxing at sea and especially helpful in managing the aforementioned sea legs/hangover conundrum (although just lying down will do the job too). Dinners on smaller vessels can mean relatively intimate dining room situations. Inevitably, you may end up eating with relatively the same crowd each evening, but try to mix up your company by inviting yourself to strangers’ tables every few nights. There are some ‘cringe’ factors on board ship, but you don’t have to be a part of that: themed nights, group photos, talent quests, bingo and forced crowd interaction. Or maybe that’s why you’re on board. Who can resist dressing up for a Gatsby-themed night anyway? Enjoy all the luxuruies that an Azamara cruise has to offer. There’s a pretty cheeky way to get a free bottle of wine. On some cruises, if you dine in the top restaurant on sail night, they will throw in a free bottle (book early). Especially if you use the kids’ club to its full potential. You don’t see the kids all day but you’ll know they’re okay. Make sure you steer clear of school holidays if you’re not a family – and sometimes even if you are. 27. Book on board for your next cruise to save money! Book your next cruise at the office on board for a (sometimes) substantial discount. All you have to do is put down a tiny deposit and you usually won’t have to pay the rest until a few months before. The pool deck from the ocean going Viking Cruise’s ship Orion.